It is so cold here and the snow just keeps falling, falling and falling. Not the greatest recipe for the opening week of training as I want to stay curled up on the couch with coffee, my leg warmers and a good book. 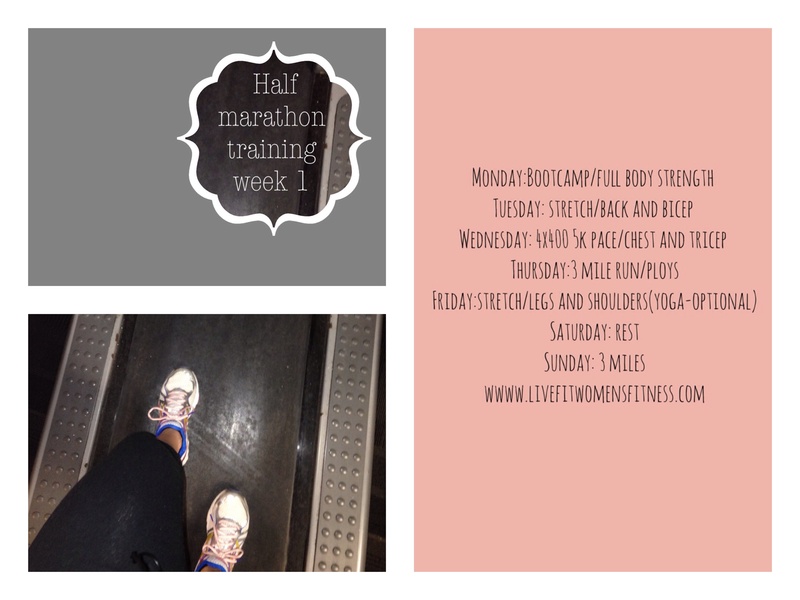 This week I put one foot in front of the other as I began my half-marathon training. I had a fair amount of days that I wasn’t feeling my run but after completion I was loving the endorphin rush and boost of positive energy. 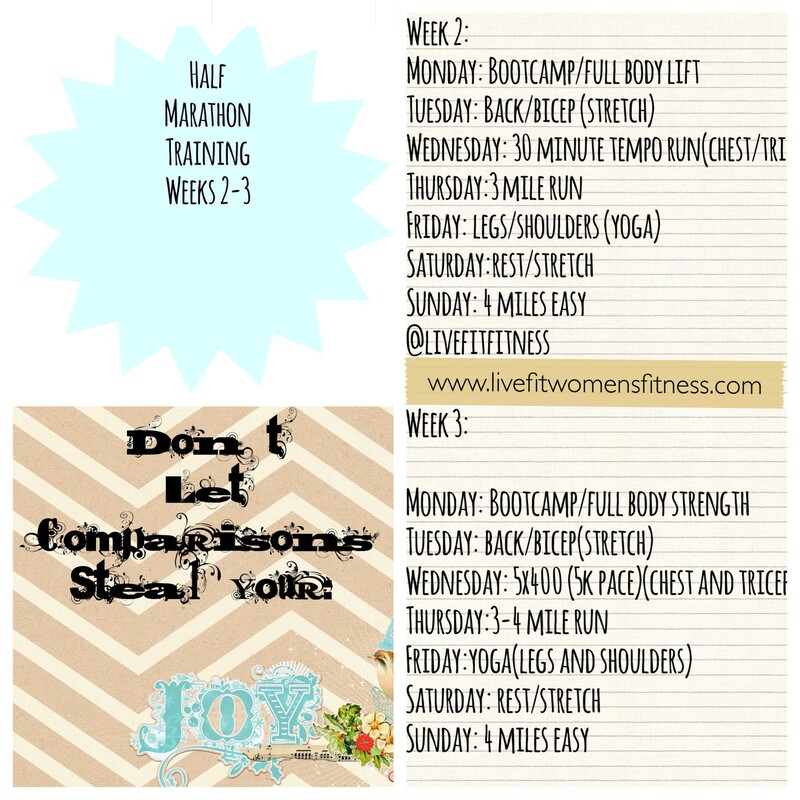 I always loved interval workouts and Wednesday I hopped on my treadmill and ran my 400 repeats. I broke down my desired mile pace for the half-marathon and my time for sprinting the 400’s (2:07) and took about a 3-4:00 minute break of running in between to fully recover between all four of the 400’s. I was able to finish up this interval (track repeats) workout in around 30-32:00 minutes. Thursday I ran 3 miles in around 26:00 minutes. Running on the treadmill has been a little hard to jump back into, but over time I will start to get used to it again. Sunday I hit the local gym with my sister in law and we ran 3 miles on the treadmill in around 27 minutes. I want to encourage you this week with this: Don’t Let comparison steal your joy.I was working with a training client who has done absolutely amazing. She started comparing herself to other women in the gym. I stopped her in her tracks and I said “Don’t ever compare yourself, stop and look how far you have come.” She is able to lift heavier, run farther, and hold yoga poses longer. My friends don’t waste your time comparing and worrying about everyone else’s journey. Focus on putting one foot in front of the other and running your race. Those comparisons creep up everywhere from the gym, to at work, church, and between you and your friends. God has us exactly where he wants us and the beauty is found admist the struggle of overcoming the tough stuff, whatever it is in your specific life. This reminds me of such an important lesson this week. To stop comparing my journey to others and to focus on putting one foot in front of the other. This week my prayer is to try to become better at focusing on how to love like Christ and to pray for his perseverance when I am feeling weak. To appreciate exactly where he has me in this specific season and to not allow comparisons creep in to steal the joy the Lord fills me with.